Here follows an account of a twelve day trip my friend Norm and I took on the Kisaralik River in southwest Alaska, August 31-September 11, 2001. We flew to Bethel, Alaska and then flew by "bush plane" to Lake Kisaralik where we camped for three nights. We then floated in a rowed raft eighty-one river miles to a gravel bar in the Kuskokwim River Delta where we were met and transported by motorboat back to Bethel. The events of September 11th stranded us in Alaska for six additional days. We made a daily recording of each day's events and I have condensed the transcript. I have included many of the details of our adventure because we very much appreciated reading other accounts of Alaskan river trips. I hope that what follows will help and encourage others to undertake an Alaskan wilderness trip. I also can heartily recommend the Kisaralik River. Norm and I both are happy to answer any questions so please feel free to contact us. We learned much from emails from strangers who were willing to share their knowledge and to them we are grateful. Ever since my college days I have wanted to go to Alaska. I remember telling people in 1970 that I wanted to experience twenty-four hours of sunlight, to see the sun circle the horizon. This, of course, is what happens in the Alaskan summer above the Artic Circle. But thirty-one years later I had not gone. I realized, not for the first time, that in order to realize this dream I had to seize the day. I had to act now or there was a danger that my whole life would pass by in everydayness. So in January 2001, near my fifty-third birthday, I said to myself, "This is the year!" Even though I had done several solo trips in the Boundary Waters of Minnesota, my family insisted that I have company for Alaska. I began by surfing the Internet and got an idea of the cost of a guided trip and airfare. But I didn't really like the idea of being "guided" and being in a group of strangers; they might be great, but if they weren't? Then I saw Norm, with whom I had done a six-day trip in Woodland Caribou Provincial Park, at a college basketball game. He said he had been thinking about another canoe trip, did I have any ideas? I told him that I was determined to go to Alaska this year. Was he interested? He was and the planning began. Why the Kisaralik River when my goal had been to travel above the Artic Circle? I met a friend of a vet who had fished several Alaskan rivers. I called the vet and talked about what we wanted to do: no fishing or hunting, just watching wildlife and being in the wilderness. He recommended the Kisaralik and we decided to go with the voice of experience. We had been considering the Noatak and the Sheenjek, which flow out of the Brooks Range. I know now as men accept the time clock of the wilderness, their lives become entirely different. It is one of the great compensations of primitive experience, and when one finally reaches the point where days are governed by daylight and dark, rather than by schedules, where one eats if hungry and sleeps when tired, and becomes completely immersed in the ancient rhythms, then one begins to live. So this is one thing: we went to live fully in each moment. Another is to go back in time before Europeans trashed North America. This is a time when there were only a few humans and much wildlife. I feel that we have a deep genetic memory of these days. After all, our ancestors survived these conditions; we carry their survival skills with us in some form. We got in touch with this is several places: when we stalked caribou, when we saw hundreds of salmon circling in a deep pool, and when we looked out from a hill and saw completely unspoiled land in all directions to all horizons. We saw a beaver pond that was completely clear; no sediment from farms washed into it. The purity of wilderness land speaks to us, creates happiness in us, in ways that highways lined with malls and subdivisions full of similar houses do not. A wilderness trip is also a test of your mettle, both physical and mental. Can you climb that mountain? Can you row hard enough to avoid that rock? Can you pull the heavy raft up on shore high enough so that it does not float away in the night? The mental test begins long before you leave. Can you digest all the information you have: make the right travel plans and bring only essential equipment? Once the trip begins the mental challenge continues: can you remember what is important (rowing technique, bear awareness, cooking and much more), can you find your location on the map, and can you make the right estimate of your travel time? Ultimately wilderness travel is self-reliance, independent living. We both realized this when our plane took off from the lake. We were on our own. If we had forgotten anything, it was too late. If we had a question, we would have to answer it ourselves. We both commented on this moment later; it was a very real thing. On a personal level this trip was about raising our camping skills to a new level. Neither or us had camped for this long before. But it also solidified us as a team. In Woodland Caribou P.P. we used two solo canoes. So we were a loose team. Here we were in the same raft and had to work as a team--one scouting ahead and the other steering. We knew each other's skills. I tied the knots; Norm packed the raft. This was not an isolated trip; it built on our other trips but it was greater than the others because more was required. So after recapitulating the history of the human race, that is, living in the wilderness much as prehistoric man who more than survived and actually thrived, we returned to the modern world on September 11th to find violence that our distant ancestors would have recognized. We were changed by those events; but we were changed more by our trip. We encourage everyone who reads this to seize the day and go into the great silence, the great solitude. 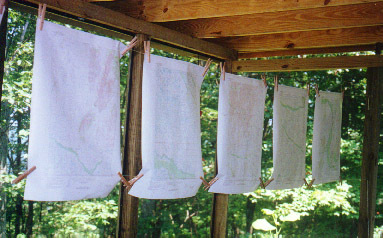 USGS maps of Alaska have been waterproofed with Thompson's Waterseal applied with a foam brush. Worked great--water beaded on the map. They could still be written on with a ball point pen (after a few days). These are clothes pinned to two strings on my porch. 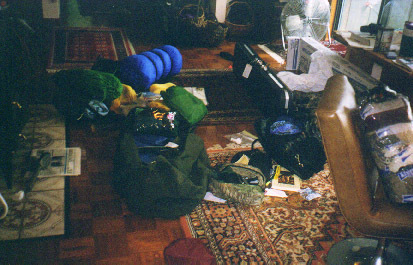 The living room is covered with loose gear. I'm trying to fit it into bags that will work on the plane. Didn't take the fan.